Latest News (18.12.2018) - RVUNL Technical Helper II Admit Card has been available now. The exam date has been scheduled to be notified in the admit card as 29th December 2018. The candidates are required to fill registration number and date of birth to download online admit card. Coloured Print out is preferred in order to avoid the photo matching problems during the entrance in the exam hall. Note - In case you forget your documents/ application form. Check out your registered mobile number. The registration number may provided to the candidates with the password. The link to download is provided in the end of the page. The below image provides the view of the page to download admit card. 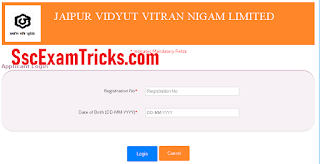 Latest news on 24th September 2018 - rajasthan Vidyut Vitran Nigam Limited has released the result of combined Technical Helper examination on official website. Earlier rajasthan Vidyut Vitran Nigam Limited had invited online application from 2nd july 2018 to 31st July 2018 for 2433 posts of Technical in JVVNL, AVVNL, JVVNL under Advertisement No. JVVNL/Karmik/Rectt./01/2018-19. The exam result has been declared on 24.09.2018 which can be downloaded by using their registration number and DOB. On 21.08.2018 – Today is the last date to apply online for Rajasthan Technical Helper posts. Keep hurry. It’s going to be too late. Don’t miss the opportunity. Fill the online form on time. The candidates must be physically fit in order to fulfill the condition of the advertisement. He/she must produce a certificate of physical fitness before the selection committee after the final selection for the advertised posts. RVUNL TH Admit card will be available at written test and document verification stages of the candidates. It is mandatory to produce printout of online admit card at the time of attending any of these days without which the candidate will be sort out or eliminated from the selection process. Xth Standard Gen. Science, Hindi, English, Elementary Maths & Gen. Knowledge with special emphasis on Rajasthan. There will be no interview for these posts. The candidates are required registration number and date of birth in order to download their online call letter for Rajasthan Helper Written Exam 2018. 3. Same photograph as given in the application form must be affixed. The qualified candidates will be called for document verification. Documents required at the time of verification. 1. Copy of online Application form duly Signed by the applicant. 2. Recent Passport size Photographs. 3. Class X/ Matriculation Mark sheet and certificate. 4. Caste Certificate (if applicable). 1. Go to the official website and click on admit card link. 2. Enter your to be registration number, DOB, Gender and verification code (displayed in the image). The admit card will be available on official website of RVUNL.